SignalR is a library that simplifies the creation and management of persistent connections between web servers and clients. This facilitates the development of applications that can display updates to data held on the server in real-time. Chat applications are the most obvious beneficiaries of this technology, but line-of-business applications that need to report availability to users can benefit too. Here, I look at extending the canonical SignalR chat example to incorporate a "who's typing" feature, and I also extend my previous Knockout example to use SignalR. First, what is the problem that SignalR is designed to solve? The web works on a Request-Response model. Browsers and other user agents make requests and web server provide a response to that request.The response is sent to the delivery address provided in the request by the user agent. And that is the natural order of things on the Web - servers can't make responses without a request. For the most part, this is not an issue, but if you want to display real-time updates on your web page, you have needed to resort to techniques like repeatedly polling the server using AJAX to see if any changes had been made to data. Alternatively, you could use Comet technology, which keeps a persistent connection open between the server and the client. 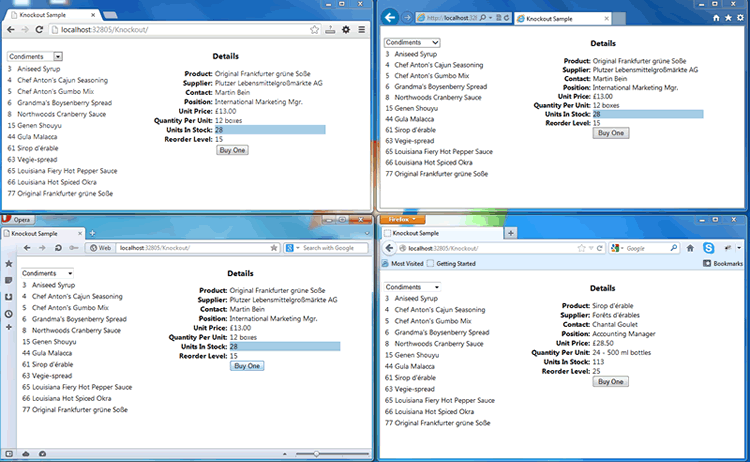 HTML5 introduced two new techniques - Server Sent Events and WebSockets. SignalR is a user-friendly wrapper around all these technologies that makes it a lot easier to create applications that require the real-time display of data. SignalR utilises HTML5 Web Sockets API where it is available, and falls back onto other technologies where they are not - Server Sent Events, Forever Frames or Long Polling, the last two of which are Comet techniques. 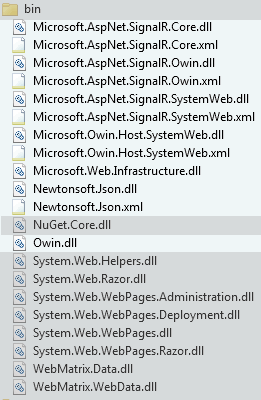 Notice that there is a reference to a script called hubs in a signalr folder, neither of which exist. This is a placeholder for the dynamically generated script that translates the Hub methods to client code. 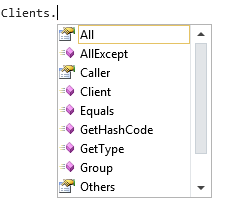 So just to recap, the button click invokes the client-side chat.server.send method, which calls the public ChatHub.Send method, which responds with Clients.All.broadcastMessage which invokes the client-side chat.client.broadcastMessage function. The chat example is easy to understand and illustrates the basic workflow nicely. But it is not a complete application by any stretch of the imagination. It needs more, and a common feature of chat applications is an indicator of who is currently typing. We can use the workflow logic above to plan an implementation. It's a rough and ready function, which takes the name passed from the server-side method, and displays it as part of a string in a div with an ID of isTyping. The text is cleared after 3 seconds. I have written about Knockout before. If you are not sure what Knockout is all about, you should read the previous article first. In that previous article, the example shows a simple application where the user can select a products, and from the resulting list, select one product to view the details. There is a simple button that results in the ViewModel's unitsInStock value decreasing by one as if a purchase had been made, and the UI being updated as a result. And that's one of the benefits of Knockout - changes to observable values in the ViewModel result in that change being reflected wherever it is bound in the UI. But the change is localised to the individual user's browser. If a product unit is actually purchased, or indeed if more are made available, it would be a really good idea if ALL current users are notified of the change in unitsInStock in real-time, right? Sounds like a task for SignalR. This time, the changes caused by user action will be stored in the database, which didn't happen in the previous Chat example. The BuyProduct method retrieves the current number of units in stock for the selected product, and permits a purchase if there are are any. The revised number of units in stock, along with the product ID are sent to the all currently connected clients via an updateAvailableStock method. The ReorderProduct method simply increases the UnitsInStock value by whatever quantity was passed in to the method by the ViewModel function. Again, the revised number of units in stock is broadcast to all connected clients. Both of these examples are available as part of a sample site available at GitHub. SignalR is a lot more powerful than these introductory demonstrations illustrate. You can write your own PipelineModule class and inject your own processing code into the hub pipeline. You can add authorization really easily to a hub method or a complete hub using data annotiation style attributes. You can read more about the latest SignalR release here.